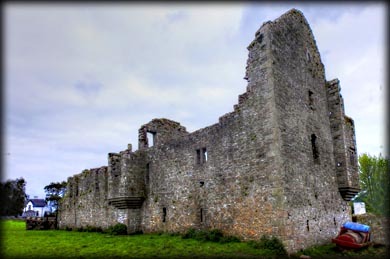 Robertstown Castle is a two storey fortified house with an attic. There are projecting two storey bartizans at the NW and SE angles. These are supported from the first floor by moulded corbelling similar to the Scottish style. 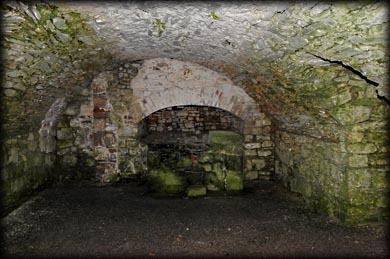 The original entrance was in the north wall, but a north wing was added to the building in the 17th century. This extension has two barrel-vaulted chambers on the ground floor. A newel stairs on the east side of the entrance leads to the second floor. 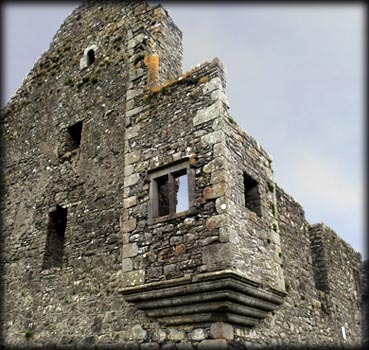 A narrow doorway on the first floor gave access to the SE bartizan/turret. There are two light windows in the upper storey and bartizans and single lights on the ground floor. This was a Barnwall Manor. A widow, Margaret Barnwall, held 530 acres with a castle and church in 1640. A graveslab in the graveyard, north of the castle, was dedicated to Alexander Barnwall, who died in 1596, and his wife Alison Netterville who commissioned the monument in 1618. Pictured above are a couple of windows/loops, and a small key-hole pistol loop in the centre. In a field to the northwest of the castle you can see the Norman motte where the first castle at Robertstown would have been located. 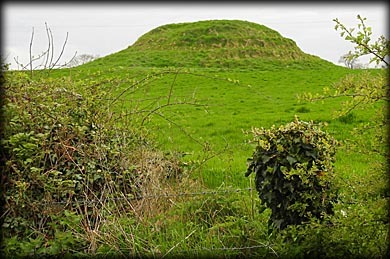 The flat topped motte, stands 4.2 metres high and is 36 metres in diameter at the base. There is no evidence of a bailey. Both the castle and motte are on private farmland, so please ask for permission before visiting. Situated: From Kells head NE on the N52 after 4.8 kilometres, take a slight left for Nobber. Then take the next right. After 3.9 K turn left onto Deerpark Heights. After 1.5 kilometres take the left turn before Cruicetown. Discovery Map 35. N 7845 8423. Last visit April 2017.